Ancient Egypt is once again the setting for an online slot and on this occasion it’s Realistic Games which is providing us with the finished article. Well-read slots fans will no doubt be aware that Tutankhamun was an Egyptian pharaoh who was buried in a tomb ultimately discovered by Howard Carter in 1922. He would surely have been delighted to learn that he is now the subject matter of a casino game. Tutankhamun plays out over five reels and twenty paylines and those reels are set into a hieroglyph-covered wall. On either side of the reels are torn tapestries. 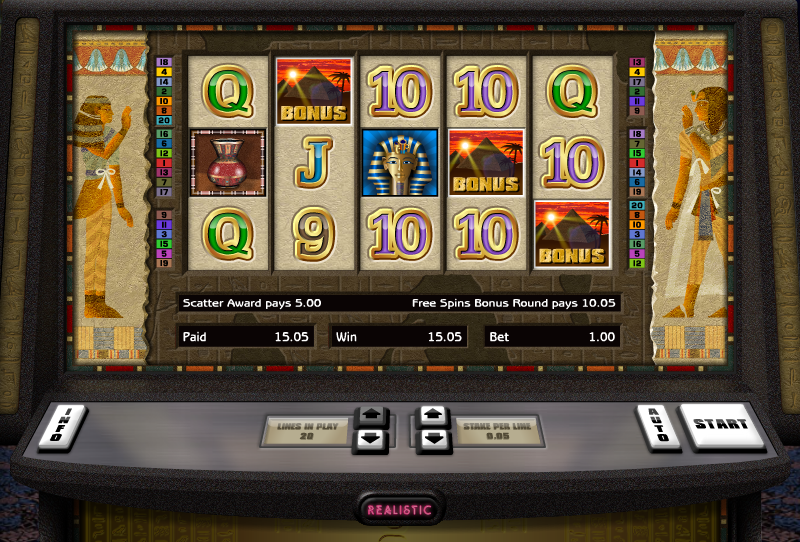 The low value symbols are 9, 10, J, Q, K and A and there are four theme-related icons which include a vase, a flower, an Eye of Horus and a gold symbol which we can’t identify, despite being veterans of Egyptian-themed slots. The Pharaoh’s mask is the wild symbol and then there’s a pyramid bonus symbols which is the key to the main feature. The pyramid bonus symbol is also a scatter and therefore it does not have to appear on consecutive paylines to make winning combos. If you can land three, four or five anywhere on the reels you will be awarded fifteen free spins, a number King Tut himself would surely have enjoyed. All wins during this feature will be subject to a 3x multiplier and you can also re-trigger the spins by landing more scatter symbols. Five in a winning line would of course win you the maximum base game prize of 40000x your line stake. This is certainly a nice-looking slot with some decent sound effects but in the end it’s more of the same really. Try it out by all means but there are more interesting games out there.